Three noncontiguous, contrast-enhanced axial computed tomography (CT) images of the abdomen revealed a 2- x 1-cm fat-attenuated,ovoid mass anterior to the cecum with a hyperdense center and adjacent inflammatory stranding (Figures 1 and 2). The appendix was normal (Figure 3). 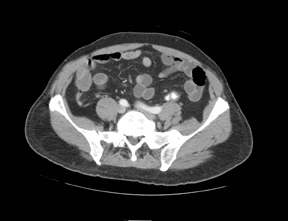 By recognizing typical imaging features of epiploic appendagitis, the radiologist plays a central role in preventing needless surgery and facilitating appropriate, conservative management. Singh, AK, Gervais DA, Hahn PF, et al. Acute epiploic appendagitis and its mimics. Radiographics. 2005;25:1521–1534. Legome EL, Belton AL, Murray RE, et al. Epiploic appendagitis: The emergency department presentation. J Emerg Med. 2002;22:9–13. Sirvanci M, Tekelioglu MH, Duran C, et al. Primary epiploic appendagitis: CT manifestations. Clin Imaging. 2000;24:357–361. van Breda Vriesman AC, Puylaert JB. Epiploic appendagitis and omental infarction: Pitfalls and look-alikes. Abdom Imaging. 2002;27:20–28. 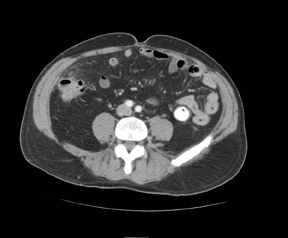 Rioux M, Langis P. Primary epiploic appendagitis: Clinical, US, and CT findings in 14 cases. Radiology. 1994;191:523–526.